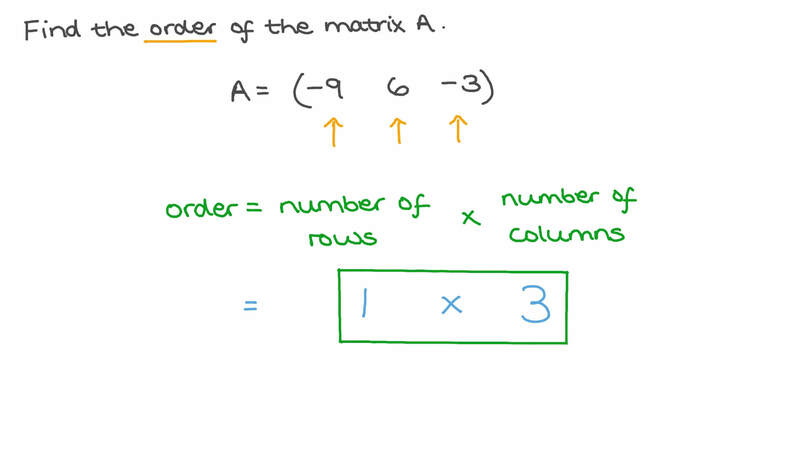 In this lesson, we will learn how to find the order of a matrix. Find the order of the matrix 𝐴 = ( − 9 6 − 3 ) . How many elements are there in a matrix of order 9 × 7 ? Find the order of the matrix 𝐴 =  − 2 − 6 − 2 − 1 − 1 6  . Find the order of the matrix 𝐴 =  0 − 9 3 3 0 1 6 8 6  .